Known pre-historically on the Southern hemisphere. Probably mentioned by Amerigo Vespucci in 1503-4. Discovered by Magellan 1519. Like its larger apparent neighbor, the Large Magellanic Cloud, the Small Magellanic Cloud was certainly known to the ancient southerners, and was probably mentioned by Amerigo Vespucci in a letter written during his third voyage about 1503-4, but became known to us only when Magellan went on his journey around the world, in 1519. 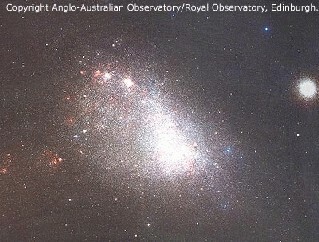 The main body of the Small Magellanic Cloud has been assigned NGC 292 in Dreyer's catalog, which is now sometimes used for this galaxy. In addition, many clusters and nebulae which are members of this galaxy have been given their own NGC numbers. This galaxy looks like a piece of the Milky Way for the naked eye. It orbits our Milky Way galaxy at about 210,000 light years distance, which makes it the third-nearest external galaxy known (after the LMC and the 1994 discovered Sagittarius Dwarf Elliptical Galaxy). Our current distance value takes into account the corrected Cepheid distance scale based on the Hipparcos satellite data published in early 1997. The SMC is of irregular type. It may be a distorted barred disk, deformed by the tidal gravitational forces of Milky Way and LMC, but this is not sure. It contains several nebulae and star clusters which can be seen in photographs and through telescopes. Our small neighboring galaxy contains the same kinds of objects as our Milky Way, in particular open clusters, diffuse nebulae, supernova remnants, planetary nebulae, and one globular cluster, NGC 121. It is situated well outside the denser regions of the galaxy, slightly north but not far from the galactic foreground globular 47 Tucanae (NGC 104). It was the Small Magellanic Cloud where Miss Henrietta Leavitt discovered the period-luminosity relation of Cepheid variables, which is since then the most reliable method available for determining large cosmic distances. In John Caldwell's observing list. In the Astronomical League's Southern Sky Binocular Club list. 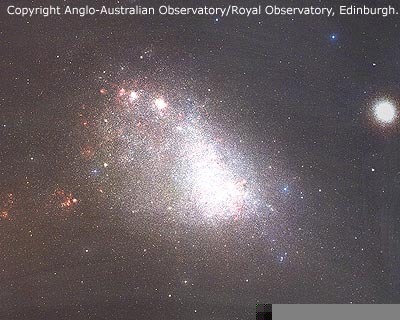 The image in this page was obtained by David Malin with the Anglo-Australian Telescope. This image is copyrighted and may be used for private purpose only. For any other kind of use, including internet mirroring and storing on CD-ROM, please contact the Photo Permissions Department (photo at aaoepp.aao.gov.au) of the Anglo Australian Observatory. The image also shows two remarkable foreground objects, globular clusters of our own Milky Way galaxy: Situated on the right is conspicuous 47 Tucanae (NGC 104), while in the left top is NGC 362. These are, of course, much closer to us than the galaxy.